‘1X2’ is an abbreviation of the three possible outcomes in a football match: home win (1); draw (X); away win (2). This market is also known as ‘HDA’ (Home-Draw-Away), or sometimes simply ‘FT’ (Full-Time match result). 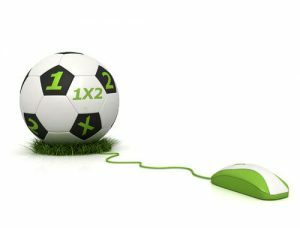 The act of 1X2 betting is referred to as “betting on the full-time result”, “match betting”, or can be termed a “three-way bet”. Full-time is reached in a football match at the close of the second half of 45 minutes’ regulation time plus the time added-on by the officials for stoppages. When the added-time has elapsed, the referee’s whistle signals the end of the game. All 1X2 (HDA) bets relating to the result of the match then begin to be settled by the bookmakers. In a fixture requiring an outright winner, in the event of a draw or tied aggregate scoreline at the end of the regulation match time, two periods of extra-time may then be played to break a deadlock. It is important to reiterate that full-time 1X2 bets are closed and settled on the result at the end of a regulation period of 90-minutes’ play (2x 45 minute halves, plus added time), and after this, new markets will then appear in most bookmaker platforms for extra periods of play (extra-time) or penalty shoot-outs. It is possible to place a match-result bet either before the kick-off (ante-post bet), or whilst the game is in progress (in-play bet). Perhaps choose to use a betting tips service and select the desired match from the bookmaker or betting exchange account of your choice. In the English Premier League (EPL) match shown below (screenshot courtesy of Betdaq betting exchange), we have elected to back the draw at odds of 3.5. (Decimal or ‘European’ odds). In this case, the bet was requested by clicking on the yellow-highlighted square bearing the odds of 3.5 in the ‘Back All’ column. Having clicked on the draw price, a bet slip opens up to the right of the screen, ready for insertion of our stake. Here, we have entered a figure of £10. The profit due from our wager should the match indeed end in a draw is shown as £25. In order to strike this bet, the next step would be to click the purple button ‘Place Bet(s)’. What do Bookmaker and Betting Exchange Odds mean? Just as a side note… When we write articles showing mathematical calculations we always prefer to use European odds, also known as decimal odds. In short, betting odds show how much you will be paid out if your bet wins. Theoretically, because there are only three outcomes to a match (home, draw or away), the probability percentages of each should add up to 100%. But, in reality, the percentages on any one match with any single bookmaker will always be above 100%; using our example odds, it’s 101.09% (35.21% + 28.57% + 37.31%). The percentage difference over and above the 100% base probability figure is known as the bookmaker ‘overround’, ‘margin’, or ‘vigorish’ (or ‘vig’). This represents the bookmaker’s expected profit. In its simplest form, for every 101.09 units the bookmaker accepts as wagers on the odds of our example match, if the wagers remain stacked in the same proportions as the implied probability percentages, then the bookmaker will pay out only 100 units, thus ensuring a profit regardless of the match result. However, our example here is a betting exchange. Like all other exchanges, it guarantees a profit from every match by charging commission on all winning bets. Here, Betdaq’s commission rate is 2%. The overround calculations now become slightly different because the commission amount has to be factored in. You can see that at the same odds, the implied probabilities now add up to 102.45%. Because of the commission element, exchanges tend to have a larger overround than bookmakers, even if it seems at first glance that exchanges have better prices. In fact, rewards are generally higher with a bookmaker. What do the Implied Probabilities mean? The important thing to remember is that converting odds into their implied probabilities is not an accurate indicator of the percentage chances of each outcome. Bookmakers adjust their odds (prices) due to demand, which leads to distorted ‘implied’ probabilities. These are normally very small and not easy to spot but enough for the bookmakers to stay in business and make consistent profits. Implied probabilities reflect much more the public perception of the likely outcome (not the statistical likelihood), being a measure of the volume of money wagered on each outcome rather than its real chances of success. And odds fluctuate throughout the ante-post and in-play markets according to the weight of money placed and other factors such as time elapsed in the match. It is, therefore, not advisable to rely on the market odds (at any moment in time) as a totally accurate benchmark of the event probabilities. In order to more accurately gauge ‘true’ probabilities, it is advisable to take a purely mathematical approach using historical results and statistics.